I went to two different bible colleges from 1981 to 1986. Bethany Bible College close to Santa Cruz, California, and Central Bible College in Springfield, Missouri. After five long years I was ready to graduate. Graduation was in May, a beautiful Spring day in the Ozarks. My parents were there from Colorado, sitting in the audience. I was wearing my black cap and gown, seated with the graduating class of 1986. The time finally came for us to walk onto the stage and receive our diplomas, which had been put into a diploma holder. Then the age old graduation tradition took place. I shook a hand and took the diploma holder and walked back to my seat. After the caps had flown and the photos were taken, I opened the diploma holder and looked in. It was empty. No college graduate diploma for me. I knew it would be empty. 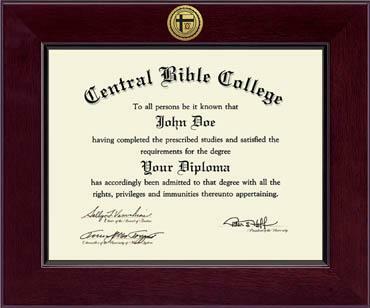 The powers that be at Central Bible College had told me that I lacked two credits to receive my diploma. I needed to take a class called Modern Cults and then I would have a piece of paper in my hands declaring to the world that I was truly a college graduate with a b.a. degree in Missions. In the meantime, they informed me, that I could walk the line and participate in the graduation ceremony. That was over 25 years ago. I had always intended to pick up those two measly credits somewhere along the way and get that diploma, but it just never happened. I ended up moving back to California with my first wife and two young daughters and began working with a youth group while working a full time job. The diploma and Modern Cults and CBC took a backseat in the car of my life, and then a backseat on the bus of my busy existence, and finally disappeared off the radar. I ended up getting a divorce and changing denominations, moving from my Assembly of God upbringing and college education, to the Lutheran way of following God. The importance of having an AG/CBC college diploma was the last thing on my mind. My life continued on and not having a diploma never kept me from doing what I wanted and having jobs that I enjoyed. I was a driving instructor and a gardener. Teaching people and caring for plants was what I loved. I did that in California and I do that now at a home for needy children here in Oaxaca,Mexico. For some reason, I recently began thinking of that diploma that I never received. I’m not sure what psychological button was pushed in my being these last few months that made me think it would be kinda nice to have that piece of paper in my hands. I always told myself that I went to Bible college to gain knowledge and get a good foundation for growing spiritually, both of which were accomplished. But something was telling me to get that diploma, if for nothing more than to put a period (or exclamation mark) to that era of my life. I started something and decided I wanted to bring it to a successful conclusion. So a couple months ago I sent an email to CBC and inquired if there was an online course that I could take to get those two credits and get my diploma. I mentioned that I was serving at a mission in Mexico helping needy children and that it would be difficult to get away to Missouri to take a class. I didn’t hear back from them and decided it was a lost cause. Then last week I received an email from Kathleen Harris in Records and Registration at CBC. She informed me that she had looked into my case and examined my records. She informed me that I needed 126 credits to graduate, and that with other classes I had taken from other colleges, I actually had 137.5 credits. But, to receive a degree in Missions, my declared major, I needed the course Modern Cults. She also mentioned that CBC was in the process of merging with two other AG institutions and that CBC was authorized to give out diplomas until May,2014, and that despite the fact that I had not taken Modern Cults, they were going to substitute one of the other classes I had taken for Modern Cults and give me my diploma. I was an official graduate of Central Bible College. The diploma was now in my file and the only question that remained was where to send the diploma. I must admit, tears came to my eyes when I read that last line. I don’t know why it was such an emotional moment for me, except that it was significant for me that a process that began so long ago had finally come to an end. I also felt overwhelmed by Grace-God’s Grace and the grace of Central Bible College. I thought of Mike Yaconelli and his book Messy Spirituality. Mike Yaconelli tells a story of how, when he was eleven years old, he had a paper route. He saved up his money to buy something special. One day he saw that something special that he had to have. A beautiful conga drum. He went to his bank, took out $20 and bought the drum. He was so proud that such a beautiful thing was all his. He took it home to show it off to his family and friends. His dad was not a happy camper and demanded to know how much it cost. Mike told him, “$20.” His dad told him to take it back! Mike writes, “For reasons I don’t really understand, the trauma of that experience burned itself deep into my soul. Emotionally, I was crushed.” Forty-seven years later he was at a spiritual retreat with his son. He told the group about his conga drum experience. He hadn’t planned on sharing this story, it just kinda came out. Of course his son had heard the story before. After telling the story, Mike sat down to prepare for communion. The chapel was hushed. All of a sudden, his son got up, and stomped to the front of the chapel, making a lot of noise. Then he disappeared behind a big podium, and finally stood up, holding a large, shiny new conga drum. Mike writes, “Tears filled my eyes as I sat there, stunned.” His son had bought the conga drum earlier and planned on telling the drum story and then presenting it to his dad. When Mike began telling the story, his son realized God had orchestrated the morning far beyond anyone’s expectations. Mike waited almost half a century to be graced with a conga drum. I waited over a quarter of a century to by graced with a diploma. God makes everything beautiful in His own time. Thanks God! That was way cool. I had no idea. Isn’t God good? As you said, in His own timing God will bring about things for His glory and our good.